Homemade pretzel bites drizzled with sweet and tangy raspberry honey mustard sauce will put a smile on your face. They’re easy to make and even more fun to eat! 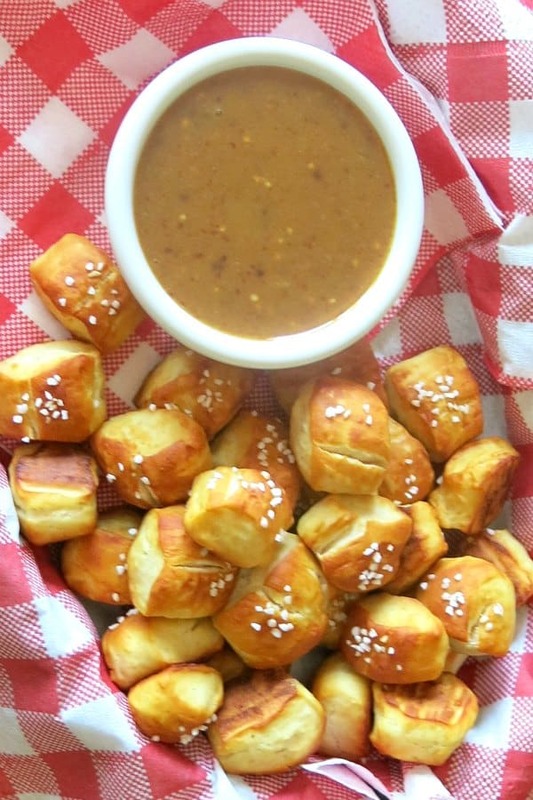 Do you love warm, soft pretzel bites, the kind you get at the ballpark or mall and dip in a tasty sauce or cover with gooey sugar glaze? They’re also perfect for parties and game day menus along with Parmesan Cauliflower Bites, Roasted Buffalo Chick Peas and a big bowl of Simple Guacamole Dip! If you’ve never had an inkling to make them, then you’re missing out on a chance to enjoy these at home. It’s not a complicated process and you don’t need to wait a really long time for the final result. 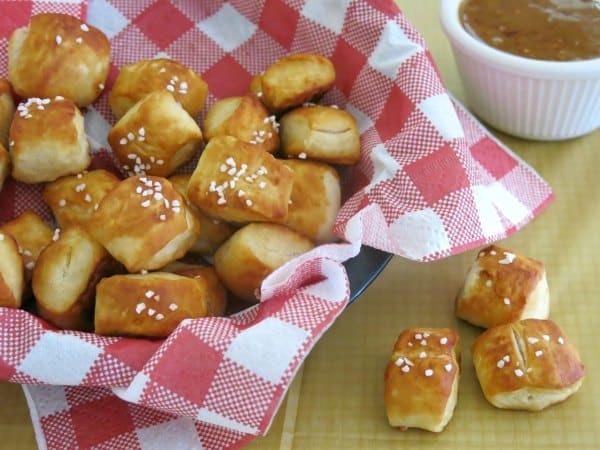 It takes just under an hour and a half, from start to finish, to make these tasty little pretzel bites, and much of that time is spent waiting for the dough to rise. The wait is absolutely worth it! My girls love to make these and I bet your kids (or the kid in you) will enjoy making them too! 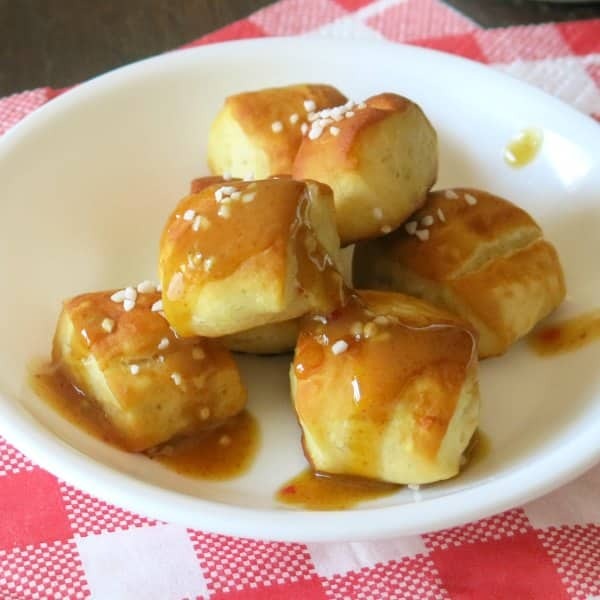 Even if you’re not a baker, you’ll be able to make these homemade pretzel bites. Follow these easy steps or scroll down to the video by the recipe card. First, mix yeast, water and a pinch of sugar together in a glass bowl. Let the mixture sit for about 10 minutes or until it looks creamy when stirred. Use instant or active dry yeast. While the yeast mixture is doing its magic, mix together flour, salt, sugar and canola oil in another bowl. Note: Use whole wheat pastry flour to make a healthier version of this recipe. 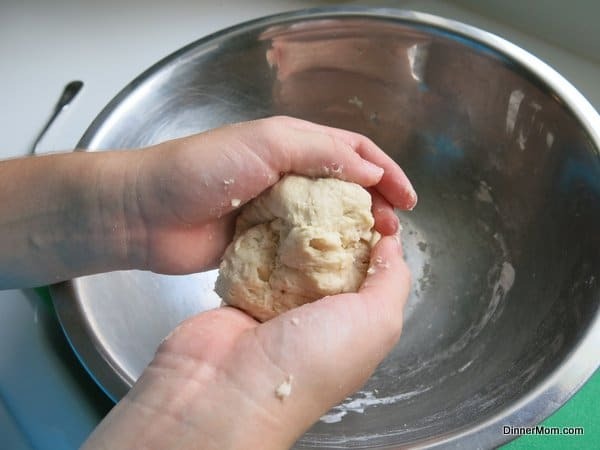 Add the yeast mixture to the dough mixture and knead until it is well-combined. This shouldn’t be a lengthy process. Just make sure it’s well-combined. 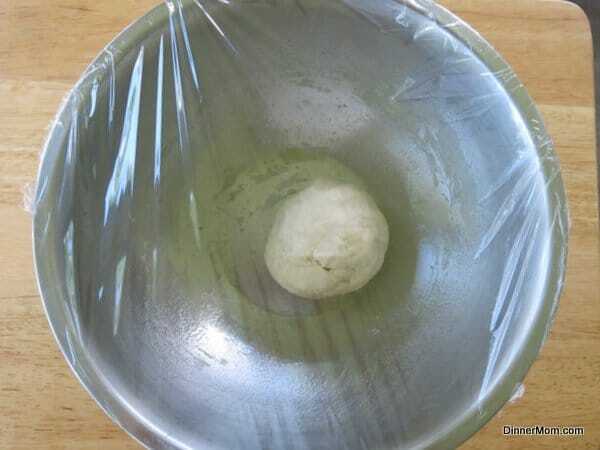 Put the dough in a bowl coated in cooking spray and cover it with plastic wrap or a damp towel. Place the bowl in a warm place, such as a sunny porch. Allow the dough to just about double in size which should take about 1 hour. The same way you make play dough into long “snakes,” roll the dough into long strips that are about 1/2 inch thick. At this point, you could form the dough into a traditional pretzel. This recipe will make about 6 full-size pretzels. Otherwise, use a pizza cutter to cut the dough into 1/2 to 1-inch bite-sized pieces. Next, the pretzel dough needs to be dipped into a hot water and baking soda mixture to get its signature pretzel flavor. Rather than boiling a pot of water, just heat the water for about 1 1/2 minutes in the microwave, until it is very hot. Add baking soda to the hot water and carefully mix. Use a slotted spoon to dip the pizza bites into the baking soda and water mixture and then transfer each piece of dough to a baking sheet lined with parchment paper. Sprinkle coarse salt on top of the pretzel bites, if desired. You could also brush with butter at too. Bake the pretzel bites in a 425 degree F oven for about 7 minutes or until they are lightly browned. The spicy raspberry honey mustard sauce we drizzled on top is quick and easy to make. Just combine spicy brown mustard, honey, raspberry preserves and mustard seed in a small bowl. Prepare the recipe up to the point where you would cook the pretzel bites. Instead of baking, freeze them on a baking sheet and then transfer to a resealable plastic bag. Defrost and cook according to directions. Make them, cook them, and freeze them, if you have any left! 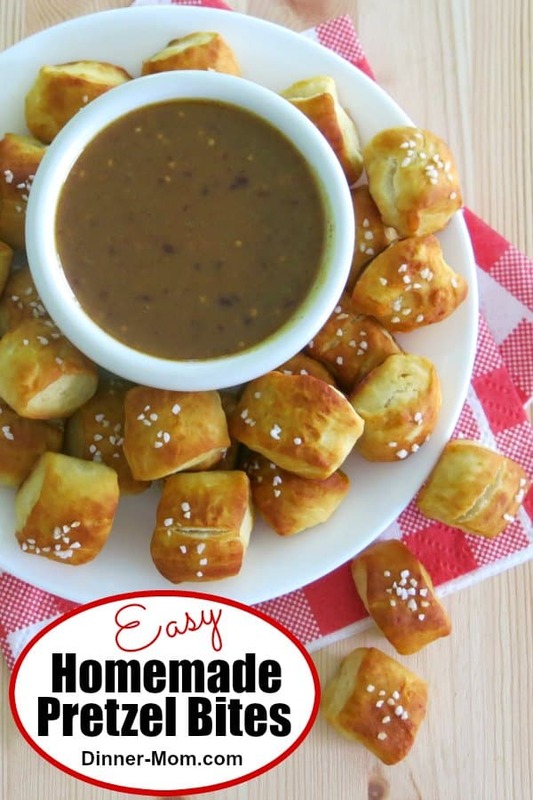 Homemade Pretzel Bites are easy to make and fun to eat! Perfect for parties, game day and snack time. Add yeast and a pinch of sugar to 1/3 cup of warm tap water. Set aside. 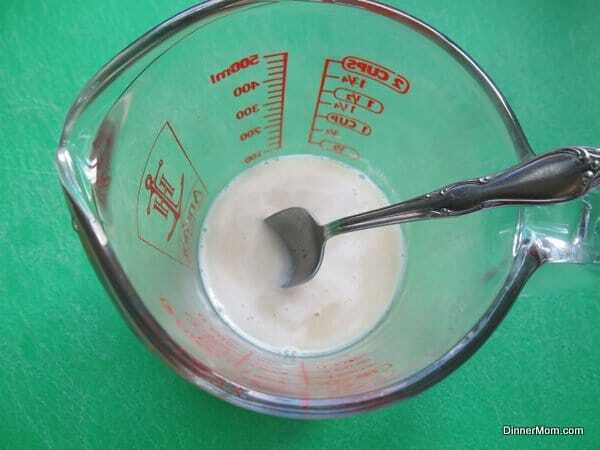 Allow yeast mixture to set for about 10 minutes or until it is creamy. Add flour, remaining sugar, salt and oil to a large bowl and mix to combine. Add yeast mixture to flour mixture. Knead dough until thoroughly combined. Place dough in a bowl sprayed with cooking spray. Cover bowl and set in a non-drafty location. Allow dough to rise for about 1 hour or until double in size. Pull off pieces of dough and roll into strips about 1/2 inch round. 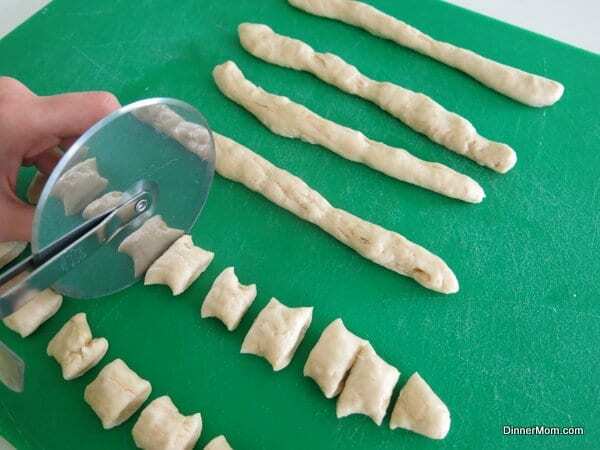 Using a pizza cutter, cut strips into bite-sized pieces about 1/2 to 1 inches in size. Microwave 1 cup of water for about 1 1/2 minutes. Add baking soda to water and stir to combine. 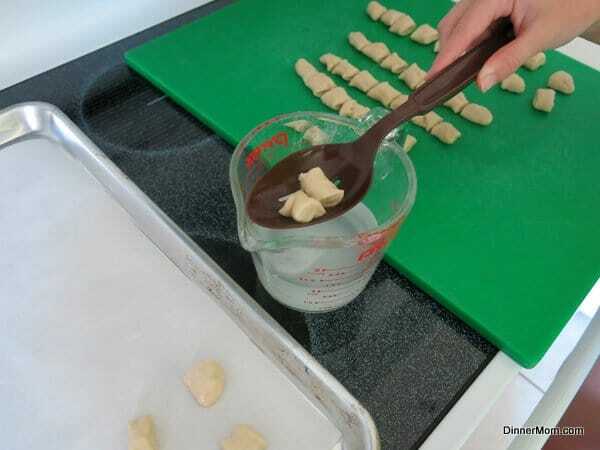 Using a slotted spoon, dip several pieces of pretzel dough at a time into the water and baking soda mixture and then place on baking sheet lined with parchment paper. Sprinkle salt over pretzel dough, if desired. Bake for approximately 7 minutes or until lightly browned, but still soft. Thoroughly combine all ingredients in a small bowl. 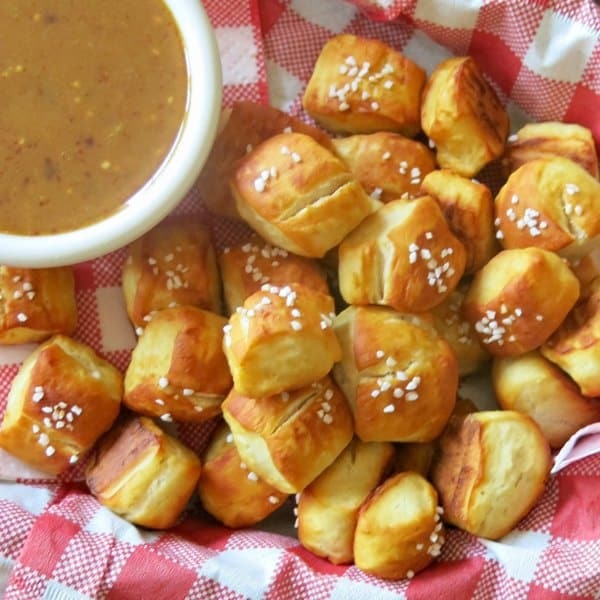 You can make ahead and freeze this recipe by preparing pretzels bites, but not cooking them. Freeze in a single layer and then transfer to a plastic bag. Defrost and cook according to directions. They can also be frozen after cooking. Thanks! Just checked out your site. Very nice! 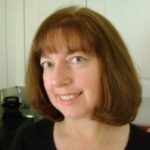 I look forward to sharing some recipes. Ahhhh…movie night with these yummy pretzel bites…perfect! Great idea! I’m going to need a lot of pretzel bites in the freezer for our Friday movie night tradition. Definitely baking soda! Thanks for commenting. At one point in your explanation you say baking soda and then another point you say baking powder. I see your recipe says baking soda so I’m assuming it was just a typo?? I want to make sure I just the right stuff. Yikes! Thanks for your comment. I fixed the typo. It is baking soda all the way!!! I’m lucky…my girls love to make them and I get to enjoy them! I could eat my weight in pretzel bites! I love the idea of a fruity mustard sauce! Yep! These are gobbled up pretty quickly at our house! I love the combination of the soft pretzels with the sweet and tangy sauce. So good! I need to double this recipe, it’s SO good.